Join the growing number of veterans, families, friends, civilians and clergy who are learning the team approach to war-related Post-traumatic Stress Injuries – a unique approach that fosters Friendships and Post-traumatic Growth. 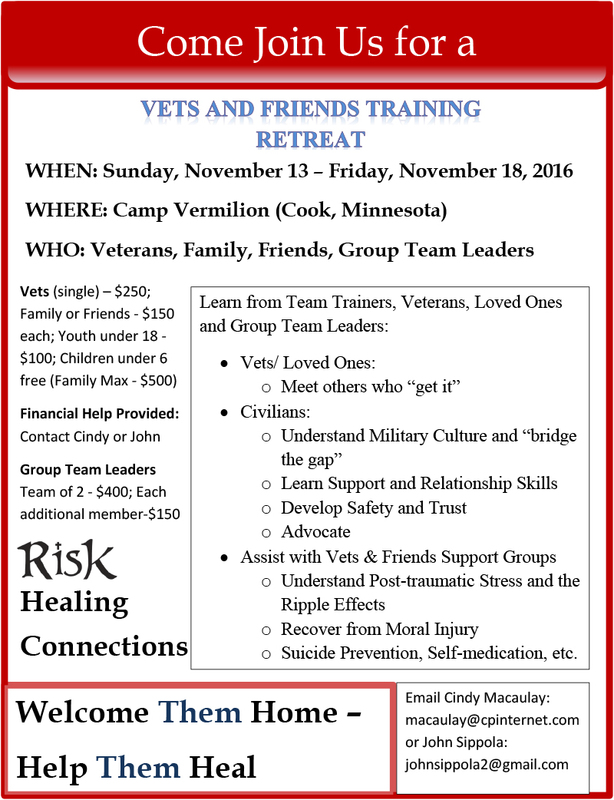 The next Vets and Friends Training Retreat will be held on 13 – 18 November at Camp Vermilion’s beautiful new retreat center in Cook, Minnesota – and You are invited. The cost: Veteran - $250, accompanying family member(s) and friend(s) - $150, youth under 18 - $100, children under 6 free (Family Maximum - $500). Past attendees include representation from Korea to the present war and range in age from 8 – 85. Understand Military Culture and “bridge the gap”. Learn Friendship and Advocacy Skills that build Safety and Trust. Identify Signs of Suicide and Provide Assistance. Address Post-traumatic Stress Injuries and the Predictable Ripple Effects. Foster Post-traumatic Growth for everyone and much, much more. Become part of a growing network of people who “get it”. Vets and Friends and RiSK Healing Connection Training Retreats are sponsored by Welcome Them Home – Help Them Heal nonprofit and co-sponsored by Voyageur Lutheran Ministries (Camp Vermilion).